Instigate brave, deep, quality conversations about shared core values across the profession. Develop a community of practice from which leaders can emerge and drive necessary change. Share accessible and concise consensus resources widely and passionately. 20/04/18 - Twice the scale yet twice the efficiency. We increased the student voice, the patient voice and the policy maker's voice to nail down the 'How'. We witnessed leaders, teams, proposals and plans emerge. Livestreams. And so for our next trick! 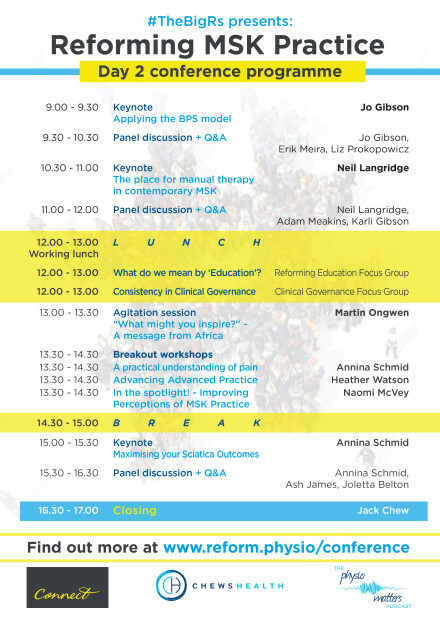 05 – 06 /10/18 -'Reforming MSK Practice' a two day clinical conference with a conversational twist! Expect frank discussions of issues and exciting, pragmatic proposition of solutions! - Bigger than usual household names. - Shorter than usual keynote addresses. We fly Erik Meira in from Seattle to discuss 'Reforming Your Relationship with Exercise'. We sit him on a panel with Ann Gates and Brad Neal. We grease the wheels of dialogue with TPMP's Rob Tyer fielding audience questions and comments. We hear from expert patient Joletta Belton about her experiences with MSK pain as part of our session: 'Reforming Patient Engagement'. We sit her with fellow patients; Pete Moore and Adrian McGregor to discuss how to learn from our past mistakes and successes. We bring together an orthopaedic surgeon, SEM doc Graeme Wilkes and ESP Physios Emma Salt and Steve Nawoor to debate triage and surgical indication under the scrutiny of Jack Chew in our 'Reforming Orthopaedics' session. If that doesn't whet your appetite you shouldn't come... and we're OK with that.